About once a month, I look at some ridiculous extraneous piece of nonsense that has taken up residence in my life or in the culture around me and say (sometimes to myself and sometimes tho whoever happens to be in my airspace), "This is why the terrorists hate us." Please understand that when I say that, I mean it. And I don’t. Who knows? It’s usually just stuff I don’t like about myself or the world around me that somehow demonstrates how we’ve learned to mock and shame ourselves. Whatever. 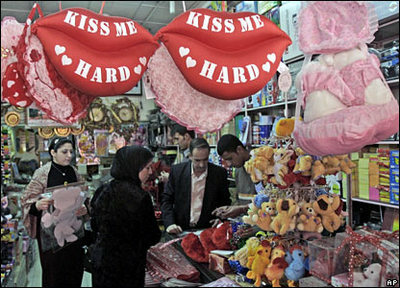 I thought it today when I was flipping through the BBC’s Day in Pictures and saw this photo from Baghdad. this is nearly as funny as the Who is your Baghdaddy? shirts I saw when I was there. I don’t know if you’ll remember me or not….but I was Jennifer Stribble’s next door neighbor for many years in Atlanta, TX. I think we also met a few times at A&M (class of ’97). I’ve enjoyed reading your site and seeing how God has worked so abundantly in your life! Wow! Three kids….me, too! Such a blessing…but also so stressful.